However long his pontificate runs, Benedict XVI's key appointment in Asia -- and likely one of the Pope's three or four most significant personnel picks worldwide, all told -- will enter the annals as that of 54 year-old Luis Antonio Tagle to Manila, the continent's largest and most influential diocese, home to a flock of some 3 million in a country whose 75 million faithful now trail only Brazil and Mexico as global Catholicism's largest outpost. 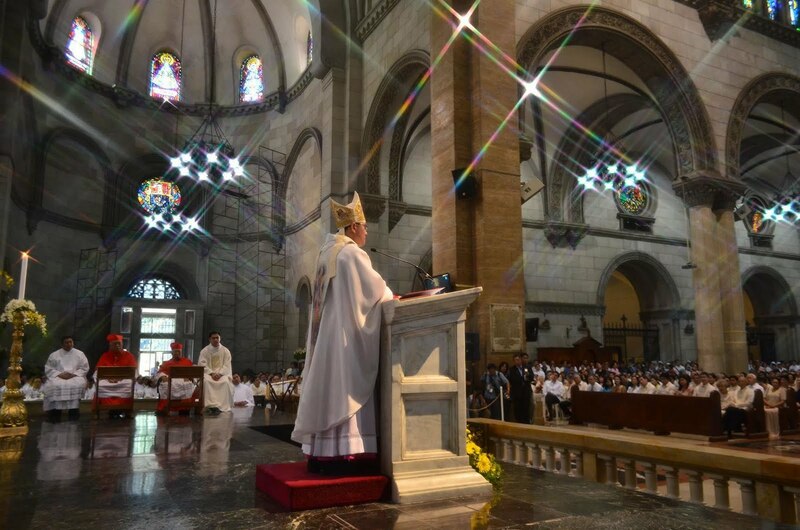 Add in Filipino Catholicism's long history as a "power church," and the 32nd archbishop of the island capital could be a major force on the national stage for no less than a quarter-century. 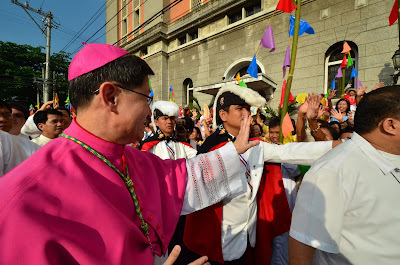 At the close of an emotional week that saw him dissolve into tears on leaving his hometown -- where he had served as bishop since 2001 -- the exuberant, media-savvy, CUA-trained star theologian known predominantly by the diminutive "Chito" took the reins of the Manila church in a Monday liturgy (above) at the city's cathedral. Keeping with local custom, politics wasn't too far removed from the festivities: the installation barely ended before some prelates took to chastising the country's President Benigno Aquino, who decided to skip the liturgy for a previously-scheduled military event. (Aquino's three sisters were in attendance at the Mass.) And exactly twenty-five years since the legendary Cardinal Jaime Sin helped spur the coup that overthrew Ferdinand Marcos and installed Aquino's mother in the presidency, the church's clout and its consequences figured prominently in the new primate's inaugural reflection. "If I am not careful, this position might even blind me to the Lord and to my people," Tagle (pron: "Tahg-lay") said. "I pray that my episcopal ministry and all ministries in the church may be rooted in humble and loving discipleship. "I tell myself as though it were the Lord telling me, 'Chito, do not think you have become great because of your new position. Be great rather in being a beloved and loving disciple of the Lord.'" This week's installation heralds the Filipino church's most colorful time of year: Simbang Gabi, the centuries-old novena of pre-dawn Masses to prepare for Christmas, begins early Friday with lanterns and fireworks. Of course, thanks to the significant growth of the famously-devoted islands' diaspora on these shores over recent years, the rite has become another December "Doorbuster" for the Stateside church.